What happens after you place an order? 1. We weigh and inspect your green beans for consistency and quality. 2. We pour your beans into the coffee roaster. 3. We custom roast your coffee order to your preferred roasting preference. Roasting 1 lb to 6 lbs of beans at any one roast. As a true small custom hand craft batch micro roaster. we can ensure a unique specialized custom roast just for you up to 200 lbs plus per day. 4. Your beans are suspended in perpetual motion in the roasting hopper allowing the chaff (covering around the bean) to be separated via our filtering collection system. This separates the chaff from the beans during our roasting process. This chaff is a paper thin membrane that burns easily and causes an additional bitter or burned taste to your coffee. The roasting of Organic Coffees requires the use of a separate roasting hopper. In order to not cross contaminate your organic coffees in the roasting, cooling and packaging process. To ensure your organic coffees are purely organic. We process them separately from our non-organic coffee production. Otherwise your organic coffees have been contaminated. This is another aspect of why our customers have discovered, "THE BLUE RIDGE COFFEE CRAFTERS DIFFERENCE." BON APPETIT! We place your beans in our fluid bed roaster hopper where your beans are suspended in the air, in perpetual motion on a bed of hot air ensuring a clean environmentally and healthy roast which is free from a hydrogen sulfide gas exhaust, offering an even roast equally to all of your beans. ​to room temperature in 90 seconds or less. Now we weigh out your coffee bean order. We use a pouch bag which has an internal reseal strip to keep the air out and then heat sealed to ensure freshness. Our bags have a gusset valve which allows CO2 to escape. You should squeeze the extra air out of the bag after you reseal it, guaranteeing you the freshest coffee consistently. 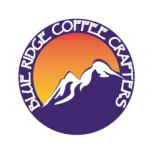 Blue Ridge Coffee Crafters offers a wider roasting range. We are different, by roasting in a bed of fluid hot air, we offer a greater flavor distinction in all of our roasts. Thus, you have your very own coffee roaster. Thank You for allowing us to offer you the best fresh roasted coffees!